This has been a bad year for energy dividends, but there are still a few out there that investors can still trust. With the price of oil recently hitting a seven-year low and natural gas now at a 14-year low, there has been a deep impact on the cash flows at oil and gas companies. Many don't have enough money coming in to drill the required number of new wells needed to maintain their production rates, let alone any left over to pay shareholders a steady dividend. This has resulted in the reduction or suspension of a countless number of energy-related dividends. All that said, there are a few energy dividends that investors can still trust. Here are three companies that have been making their dividend a priority. After Kinder Morgan's stunning announcement that it would cut its rock-solid (or so I thought) dividend by 75%, just days after announcing that it would generate plenty enough cash in 2016 to cover payouts, it's hard to put much trust in any energy company's ability to pay a steady divvy. But if there's one company with a dividend you can depend on, it's Phillips 66 (NYSE:PSX). PSX Payout Ratio (TTM) data by YCharts. As you can see above, Phillips 66's dividend only consumes 24% of profits. That leaves the company with a pile of money to invest back in the business (both for upkeep and expansion) and activities like share buybacks. The elephant in the corner is oil and natural gas prices, right? Not so fast. Phillips 66 may not be completely immune from energy prices, but it's structurally much less affected than the majority of the industry. The company's refining segment benefits when domestic crude prices are down relative to Brent, and natural gas is a major feedstock for its chemicals business. In other words, cheap oil and natural gas mean lower input costs. That's good for the bottom line. The risk is in its midstream segment, where commodity exposure has seen profits fall by 75%. But even with that hit, the company's earnings are down barely 1% for the year. When adjusted for gains from a business that was sold off last year, profits are actually up this year. 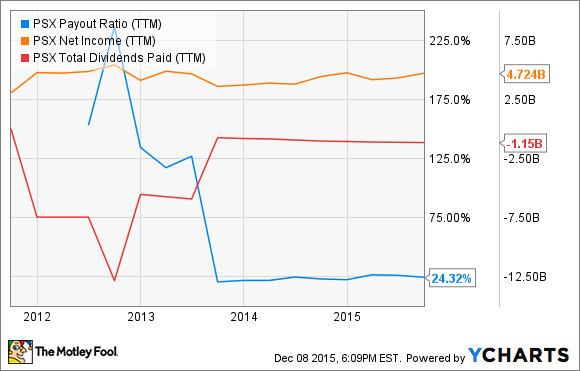 Phillips 66's 2.5% dividend is more than just trustworthy. It's far more likely to be increased than get cut. Our top priority is the dividend. [A] compelling dividend is a core element of our value proposition and we think it is still appropriate. We're continuing to drive positive momentum in our underlying financial returns, a key focus area for us especially in this low-price environment. The company stands so steadfastly behind its dividend because it firmly believes that having a strong dividend forces it to be more disciplined. Practically, this means that it won't chase growth for the sake of growth and that it will maintain a strong balance sheet during good times and bad so that it has the flexibility to continue the payout. Another reason that ConocoPhillips remains confident that its dividend isn't going anywhere but up is its ability to quickly adapt to the current downturn. The company recently set its 2016 capex budget, which is 25% less than it spent last year and 55% less than in 2014, and yet it still expects to grow its production 1% to 3% over last year. Furthermore, it has taken $2 billion out of its operational costs since 2014. All that said, at the moment ConocoPhillips isn't yet generating enough cash flow to pay for its capex and its dividend, though that is by design. The company has been working toward a goal of being cash flow neutral by 2017 under a range of commodity prices, and it's sticking by that target date. In the meantime, it plans to use some of its debt capacity as well as sell non-core assets to bridge the gap. Unlike a lot of oil companies, ConocoPhillips' top priority is its dividend. Because of that, it entered the downturn in a position of strength, which means it can still comfortably maintain its dividend despite the persistent weakness in oil and gas prices. ExxonMobil (NYSE:XOM) is well positioned to protect its dividend, even with oil prices below $40 a barrel. There are at least three key reasons why. ExxonMobil has had a history of increasing its dividend for more than 30 years. While past performance is no guarantee of future results, it's informative to note that the trend window includes a reasonably long stretch of time when oil prices were largely below $20 a barrel. That history showcases that the company has a good record of surviving -- and rewarding shareholders during -- some pretty tough times in the oil patch. ExxonMobil's dividends are still very well covered by its operating cash flow. It generated nearly $9.2 billion in cash from operations in the quarter ending Sept. 30, 2015, and only around $3.1 billion of that went to pay dividends. ExxonMobil is reducing its capital spending in response to the current relatively low oil prices, but due to the timing and placement of existing capital projects, it still has new production coming on line over the next few years. Production is what allows ExxonMobil to pay its dividends, and that looks very likely to continue, even with today's oil prices. ExxonMobil boasts a AAA debt rating -- an indication of an exceptionally solid balance sheet. With a debt-to-equity ratio around a very low 0.2 to go along with that top-notch debt rating, there's plenty of flexibility to weather another storm of low oil prices. Dividends are still not guaranteed payments, but given those three key reasons, ExxonMobil looks very well positioned to be able to protect its dividend, even with today's oil prices below $40 a barrel.